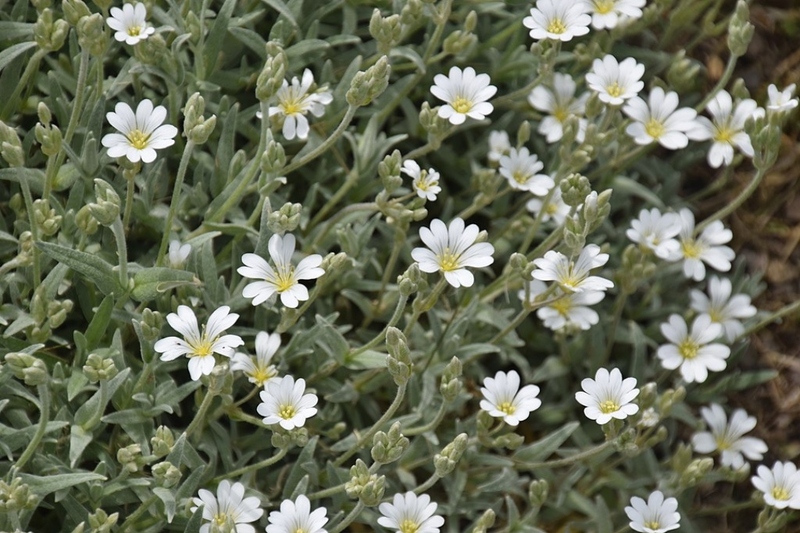 Snow-in-Summer (Cerastium tomentosum): growing, planting, caring. A cousin of the pink, with numerous and discrete flowers, with silver foliage. The snow-in-Summer is an herbaceous flowering plant in the Caryophyllaceae carnation family, native to alpine regions of Europe, and a popular ornamental in gardens the world over. It is generally distinguished from other species of its genus by its "tomentose" or felty foliage. The stems & leaves are silvery-grey, whilst the flowers are star-like, white & about 15mm across. Tomentose chickweed is satisfied with any type of garden soil, with a preference for well-drained ones. A sunny slope is often the best location. The ideal planting period is spring. We advise to keep about twenty centimeters between each plant, and to mulch between them the first year. Then your tomentose chickweed will expand very quickly to fill these spaces. To install the chickweed, prepare the planted area by breaking it down with a fork. If your land is very heavy, add gravel at the bottom of the hole. Plant without burying the bottom of the leaves - the contact of the earth promotes their decay. After planting, water copiously. To mulch, avoid organic mulching in heavy soil. They hold the winter water and tomentose chickweed hates it. A mineral mulch - pebbles - is better. In the open soil, water the first months if it is very dry. Wait for the top soil to dry between two waterings. Tomentose chickweed are very vigorous and spread easily : remove any misplaced or invasive stems. At the end of the season, trim the flower stems to keep the low shape of your chickweed. A pruner and some patience will do the trick.